Before the 2017-18 NHL season begins, the Detroit Red Wings need to trade one of their three goalies. Accomplishing this will prevent in-season headaches and reinforce the rebuild-on-the-fly philosophy. 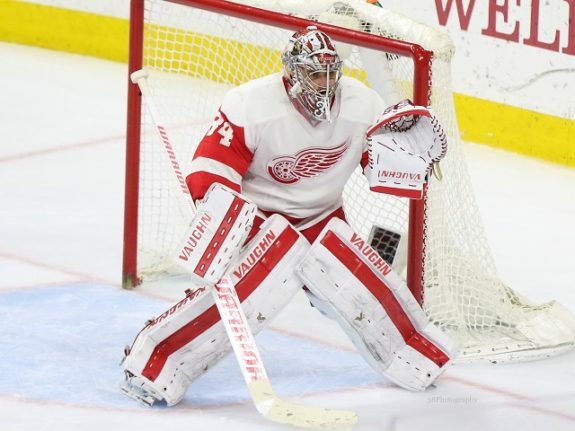 If the season started today, Petr Mrazek, Jimmy Howard and Jared Coreau would need to be on the Red Wings’ roster – none can be assigned to Grand Rapids without clearing waivers first. Further, the trio combines to take up nearly $10 million of the $75 million salary cap according to CapFriendly. With other organizational issues that need to be addressed, Detroit simply should not be worrying about dividing ice time among the three goalies. Confidence is a goalie’s strongest asset. Not having it and losing playing time to others can wreak havoc on even the most talented goalies. Of course, professionals—and more specifically, NHL goalies—should have the mental toughness to deal with this sort of adversity, but you also have to remember that they’re human and can’t handle every scenario perfectly. To those points, having three goalies on the roster is a recipe for failure. Managing the expectations, mindsets, and confidence of three NHL goalies desperate to see the ice and establish themselves as the go-to guy can become nightmarish. Even having a two-goalie rotation can be troublesome. Just look at last season. 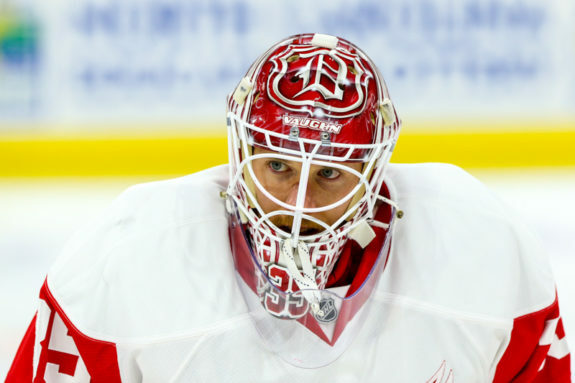 After Mrazek lost the starting job and Jeff Blashill opted to go with whoever was playing best, the young goalie struggled to stay confident, find his game and establish chemistry with his defensemen. Howard’s mental ability to expect little and work with what he had was the right approach but isn’t sustainable over the long-term. For the upcoming season, imagine this scenario happening again, but with 33-year-old Howard likely regressing a bit and Coreau being thrown into the mix full-time. It will not work out favorably for the Red Wings. To become a better, more confident team and to continue building for the future, a goalie needs to be traded. Which Goalie Should be Moved? If Holland plays this scenario like an investor would, then he’d sell high on Howard. It is true that he is older than the others and commands a higher salary, but Howard’s value will not increase. His 2016-17 season was one of Detroit’s few bright spots; Howard’s .927 save percentage topped that of Carey Price and Devan Dubnyk. And that came behind a porous defense no less. Simply put, the Red Wings need to capitalize on Howard’s resurgence by trading him and acquiring assets to help the team down the road. At the opposite end of the spectrum, moving Mrazek now would be selling low on the netminder – not something a rebuilding franchise would want to do. If it becomes clear that he will continue to fall from grace, then you’d have to accept the loss and move on. But Mrazek has undeniable talent. Some issues need to be worked out of course, but it’s a fact that he has the raw abilities to become a successful NHL goalie. And considering the market’s reaction to Mrazek being left unprotected during the Golden Knights expansion draft, there may not be any teams interested considering Holland made it known that the young goalie could be had. In Detroit, Coreau’s play was two-sided as well. He stole the starting job from Mrazek, recorded the most shutouts among the three netminders, and even earned the Centennial Classic start. However, Coreau also a goals-against average over 3.00 and a subpar save percentage behind the same defense that protected Mrazek and Howard. What all this means is that the jury is still out on Coreau. The former undrafted free agent could still improve and become a reliable starter. Then again, his play could regress to that of an NHL-AHL tweener. Detroit could always attempt to pass Coreau through waivers, assign him to Grand Rapids, and revert back to the Mrazek-Howard rotation. But, like Martin Frk and Teemu Pulkkinen, someone could claim the goalie and the Red Wings would get nothing in return. Because his perceived value is not terribly high, it’s worth holding onto Coreau to see where things go. He wouldn’t fetch much now in a trade, so why not wait to see if that changes for the better? Though he is presently the best goalie of the bunch, Howard should be traded. A three-goalie rotation is not desirable and moving the veteran aligns with Detroit’s strategy to rebuild and commit to younger players. Making the trade is absolutely necessary, but will be hard to do. After the main portion of the free agency period concluded, every team came away with a starter and backup on NHL contracts. There are a few teams with unreliable backup goalies—Minnesota Wild, Los Angeles Kings, and the New York Islanders—but none are desperate to upgrade the position. Holland will need to wait for an injury, unforeseen retirement announcement, or another event to swoop in and make a deal.